Will gradually expand these root explanations to full pages while retaining the concise version. Brief synopses don't really do them justice. Old Irish. art, Latin ursus, Greek. αρκτος, Albanian. Ari, Armenian ar, Sanskrit. rksa-. Neanderthal man stored cave bear skulls in stone cabinets in high caves in Switzerland (Wildkirchli, Drachenloch and Wildenmannlisloch) and Germany (Petershöhle) suggesting a cave bear cult even before the modern version of homo sapiens entered europe about 40,000 years ago. The above root is found in the names of three European cities Berne, Bayern and Verona. The Celtic bear goddess was called, Artio, and young girls in Greece that danced for the goddess, Artemis were called αρκτοι(bears). The name Arthur derives from the Celtic root, art, was earlier the name of a Celtic god, Ardehe, or Arthe, about 6th century BC, to whom there is an altar inscribed in the town of St. Pé d'Ardet which is situated in the Pyrenees in the Vallée de l'Ourse or Valley of the Bear. Of course the cave bear went extinct short after the period it was painted in the cave of Chauvet in France, maybe 30,000 years ago, and all later references and mythologies refer to the Eurasian Brown Bear. Possibly derived from the noun *h2(hx)-s-tér ember or *h&2ehx-s- to burn. Middle Irish ser star;Latin stēlla star, English star; Greek astēr star; Armenian astl star; Hittite hasterza star and Sanskrit tãras stars. The old Irish goddess, and Queen of Connacht in the epic the Taín, name is derived from the root *medhwiha- intoxicator which is cognate with the Sanskrit mãdhavī. See also *mélit for honey and *médhu for mead. A cave painting in Valencia Spain, depicts a honey harvester with bees swarming around in Cueve de la Arana (cave of the spider) dating from circa 13,000 BCE. Old English leax salmon, Old High German lahs salmon; Lithuanian lãšis salmon; Tocharian B laks fish. The general name of tree ,*dóru, is attested in eleven different groups, either under its root form: Old Irish oak, daur; Greek treetrunk/wood/spear δορυ (doru); Hittite tree or wood, tãru, Avestan tree/tree trunk/ wooden weapon, dãuru; Sanskrit wood ,dãuru. Or in derivation: modern English tree; Greek tree/oak δρυσ(drûs); Old Church Slavic (OCS) wood, drûva; Albanian tree/wood , dru and oak drushk; and Sanskrit wood ,dãuru. While the evidence for the origin of Proto Indo-European points towards the largely treeless Pontic Caspian steppe, it may be signficant that in Celtic and Greek, which cultures gestated within the temperate woodlands of Europe, the root tends to refer specifically to the oak tree and has religious connotations such as the word druid -i.e tree-knower or dryad - tree nymph. 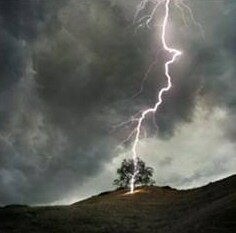 In particular the oak tree is associated with the chief deity of most of the Indo-European peoples who is the yielder of the lightening bolt. (see The Workship of the Oak, Celtic Tree Worship and Sacred Groves). A fermented drink made from honey. Old Irish mid, Modern English mead, Latvian medus, Greek méthu -wine, Avestan meθu - berry wine, Sanskrit mádhu - honey / wine. Further east we find the notion in Chinese 道 tao or dao, The Way, a comprehensive philosophy of life which unlike the introverted philosophies of India is very much imbued with awe at the physical wonder of the world. Further east again in Japan the word reverts again to many different paths with the word 道 - dō . It retains its abstract sense and can be found in the names of many disciplines such as Bushidō 武士道 - the Way of the Warrior; Chadō 茶道 - the Way of Tea; Jūdō 柔道 -the Gentle Way; Kendo 剣道 - the Way of the Sword, Aikidō 合気道 - roughly, the Way of Harmonising (with) Life Energy. The indigenous Japanese pantheistic religion is called Shinto 神道, roughly, the way of the spirit/s. The dash and lower part of the character denotes movement and the right part of the character denotes chief/main. So the kanji in its most prosaic sense means main road. dhárma (SKT) - moral duty. O.E. cran &quot;large wading bird,&quot; common Germanic (O.S. krano, O.H.G. krano, Ger. Kranich,Welsh garan, Lith. garnys &quot;heron, stork&quot;). Although this bird has been absent from Ireland for about three centuries the birds role in ancient society has been forgotten. This is due in part due to the fact that its name in Irish is similar to that of the Grey Heron (An Corr vs An Corr Glas). The animal appears to have been domesticated and is thought to be represented by the bird leading the procession on the Ahenny Celtic Cross. Knocknagor (cnoc na gcorr - hill of the cranes/herons); Reaskcor (riasc corr - marsh where cranes gather);. Taras are goddessess of compassion that are each said to be a personification of a tear of divine compassion. There are references of up to twenty one different taras who are differentiated, in the first instance, by colour. ie. the White Tara, Green Tara etc. It may be noteworthy that in James Joyce's Finnegans Wake, Isabel falls to earth as a singult tear and the names of her twenty eight companions are all colours. The Sanskrit title has two meanings: saviour and star. In the first sense it derives from the Sanskrit root tr?, which means to cross, traverse (river etc) to transport, surpass or overcome; also to liberate and to escape. In the latin noun ter-minus, boundary, limit, terminal, term the emphasis is shifted, the Roman deity Terminus, presided over boundaries. The second sense, star, is derived from the Sanskrit root, str?, which means to scatter, expand or spread out and is related to the English star, aster and strew. The Indian term for illusion is māyā derived from the Sanskrit verbal root mā to measure, to measure out, to form, to create, exhibit or display. It refers to the power that creates an illusion and the illusion itself. Māyā is experienced as fascination, charm; specifically feminine charm. It is said to possess three powers: a Veiling Power, a Projecting Power and a Revealing Power. Related to the PIE root for moon?